REALISTIC 360-DEGREE FLICKERING & SWAYING EFFECT — Real-Flame Effect Pillar Candle moves and dances, its wick flicks and sways 360 degrees, creating an unique flickering flame effect, just like flame of real candle! PLEASANT SCENTED REAL WAX — Made of real wax, have the pleasant scent ( from CPL Aromas, UK, one of the world’s 10 top essence companies), along with the warm yellow glow, ENKINDDLE flamless ivory candle will fill your room with a soft, ambient glow, sending forth sweet and pleasant aroma. LONG-LIFE & ENERGY-EFFICIENT CANDLE — This is a battery operated candle, 2 x C batteries (not included) are needed for operation. It will last for over 500 hours with a change of new batteries! BATTERY LIFE SAVER WITH REMOTE CONTROL — Features a 4 hour timer, the led candle with remote automatically turns on and shuts down everyday. What’s more, it will be automatically off after working 20 hours. Wait a minute…from a distance, want it to be off? Just press OFF on the remote! 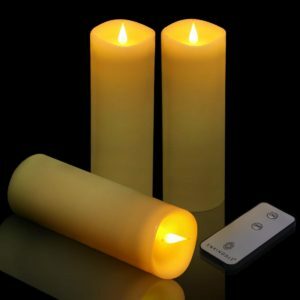 VERSATILE & SAFE FLAMELESS FLICKERING CANDLE — Soot and mess free, this cream-colored remote control candle provides ambience-enhancing illumination without the hazards of a lighted flame, super ideal for holiday celebrations, wedding ceremonies, church gatherings, or special occasions, such as birthday parties, romantic dinners, and anniversaries, etc.